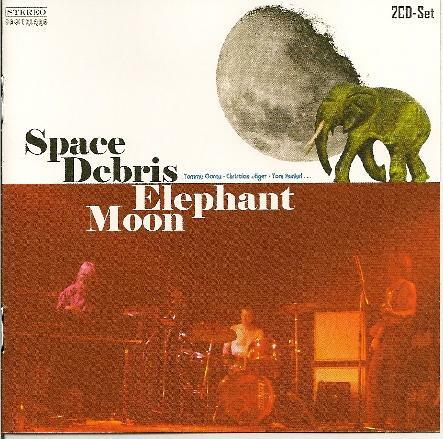 Space Debris - "Elephant Moon"
I had unfortunately not heard any other albums by Germany's Space Debris before I listened to this, their fourth and latest album. Now this is an error I know I am going to have to correct very soon by getting my hands and ears on their previous albums, because I have to tell you, I was summarily blown away by what I heard on Elephant Moon. So what did I hear, you may ask? Space Debris create a dazzling and complicated blend of 70's style classic rock jams, Krautrock, space rock, psychedelia and fusion jazz. It's mostly instrumental, with tracks often stretching into the 15 and 20-minute range, but never seeming that long, and the musicianship, I have to say, is outstanding on every level. Take just the opening cut, for example, of this epic double CD (a total of more than 150 minutes of music! ): it's a track called Free Spirits, and it sets the tone beautifully. Clocking in at nearly 22-minutes, it starts with some mysterious liquid guitar noodling and synth percolations from guitarist Tommy Gorny and keyboardist Tom Kunkel. They float along like a cosmic river to some brisk cymbal work from drummer Christian Jäger. Then Peter Brettet's bass kicks in and we're off on a dazzling rock voyage of elegant and edgy psychedelic guitar work and spacey, tripped out organ playing. One thing I see mentioned about Space Debris time and time again is the wonderful, warm, vintage organ sound they have, and here is no exception, it sounds absolutely brilliant. The band rocks from hard and loud to far out and spacey all through the course of Free Spirits, culminating in a glorious, exotic and emotional fusion finale reminiscent of classic instrumental Santana and 70's era Al di Meola. After this piece I just had to sit back and breathe slowly, the simple word "wow" on my lips. And this was only the first cut! I still had 130-minutes of music to go! Did the band live up to the to unbelievable promise of that first piece? Mostly, yes I am happy to say, they did. Space Debris are best in the environment of their extended pieces, which give all the players a chance to stretch out and really do some exploring, and explore they do. The 15-minute Heliopolis starts with a somewhat ambient and jazzy opening (with some lovely melodic piano playing) before it amps up into a sizzling space rocker, with lots of heavy guitar and spacey synths. The band has a beautiful sense of drama as they build their pieces from simple beginnings through numerous twists and turns to spectacular conclusions without things ever once sounding disjointed. It all flows so naturally, it's a pleasure to hear such complicated music played with such obvious ease and enjoyment. Another outstanding track is Disc 2's Jazzvibe Explorers, whose title pretty much says what it's all about. Propelled along by an upbeat swing rhythm, this one features some of Tom Kunkel's best organ work on the album, jazzy, funky and fluid, it just sounds terrific. The second disc also has the magnificent 21-minute Black Viking, which starts out as one of the heaviest pieces on Elephant Moon, full of crunchy riffing and blistering wah-wah guitars, before it slides into one of the most moving and beautifully played, melodic, liquid psychedelic sections on the album. A somewhat rhythmically experimental section takes the piece towards its conclusion, an intense passage of sometimes driving, sometimes stomping space metal with synth and organ sequences swirling through it. The band's shorter pieces are successful as well, though they don't display quite the inventiveness or excitement of the longer cuts, in my opinion. Still there are some great tracks amongst them like the edgy and tension-filled Japanese Girl, the dark and menacing cowbell propelled Return of Voyager, and the bluesy Medicine Men, with its expressive and soulful organ. And the band gets really freaky and experimental for the 3-minute long Allen Äppler Party, which defies description and must be heard! Less successful is the somewhat standard rocker, Winter, which is the only track on the album that features vocals (in general, I gather, a rarity on a Space Debris album), the equally standard and somewhat bland sounding Unknown Song, and the Middle Eastern influenced space rocker Space Debris Truckin', which I really wanted to like more because it starts out great but it just kind of peters out halfway through. Ah, but the slight missteps on this fantastic album are few and far between and are more than made up for by unbelievable monster tracks like Free Spirits, Heliopolis, Jazzvibe Explorers and Black Viking, as well as the many brilliant shorter cuts too. Simply put, Elephant Moon is an epic win, almost certain to make it into my top five albums of the year. Highly recommended!